In today’s NHL rumor rundown, there is updates on the level of interest in college free agent Nico Sturm, developments on the coaching situation in Ottawa, Finally, there is news on Roberto Luongo’s injury condition and what it means for both the Florida Panthers and Vancouver Canucks if he can’t continue to playing. There are a number of updates on college free agent Nico Sturm in today’s rumor mill. Mike McMahon reported on Twitter that’s he’s been told it is “highly likely” that the forward from Clarkson will sign an entry-level deal and forgo his senior season. Multiple teams have lined up showing enough interest that it’s become a fairly easy decision. Mike McMahon also notes that the team to watch here might be the Ottawa Senators. There are other media guys in other cities noting their teams might be after Sturm as well. Michael Russo notes the Minnesota Wild are going hard after Sturm and if they are able to sign him, would be willing to bring him in right away and burn a year on his entry-level deal. Bruce Garrioch of the Ottawa Sun is reporting Ottawa Senators GM Pierre Dorion is looking at a number of candidates for the head coaching position with the Ottawa Senators after this season but current interim coach Marc Crawford is making a case for himself to get the full-time gig. Though Dorion joked with Marc Crawford “if he goes 18-0 he’s got the job,” the reality is the 58-year-old veteran NHL coach has emerged as a serious candidate because since he’s taken over he’s made an impact on the approach and the way this team plays. The Senators don’t plan to talk with anyone until after the season end and exit interviews are conducted with all the players. Another strong candidate is AHL coach in Belleville, Troy Mann. Eugene Melnyk is looking to bring a president of hockey operations, but it shouldn’t have any effect on the coaching position. Sportsnet’s Nick Kypreos said that Melnyk is reaching out and asking for help and that Trevor Linden is one person who appears to have been contacted about the position. Roberto Luongo Calling it Quits? 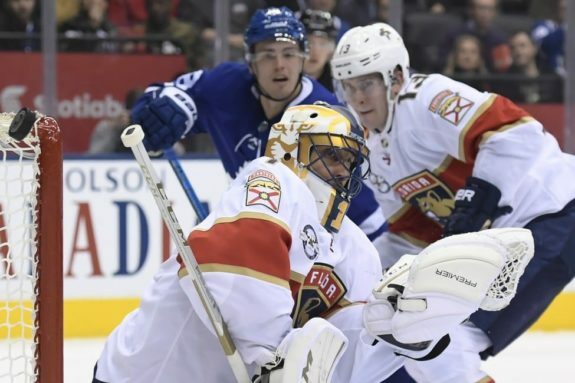 Kypreos also noted on Saturday that injuries are playing a huge factor in what will happen with goaltender Roberto Luongo‘s NHL career. Interestingly, the Panthers were already rumored to be interested in goaltending free agent Sergei Bobrovsky. If Luongo can’t continue, that interest is pretty much a certainty. Edmonton Journal’s Jim Matheson writes that the Edmonton Oilers might have some trouble signing their 2015 sixth-round pick John Marino. He just completed his junior season at Harvard but because he played a season of USHL hockey, he could opt to become an unrestricted free agent. Edmonton could still sign him but other teams could as well. The 21-year-old defenseman had three goals and 11 points for Harvard.